The Bible Museum (Goodyear, AZ). The attractions collected here use biblical manuscripts, archaeological artifacts, artifact replicas, and other biblical replicas to narrate scriptural history. Exhibit collections discuss religious art, cultural history, translation and distribution, and language change. This one room attraction is located on the first floor of a Hampton Inn & Suites on the far western sprawl of Phoenix. The attraction describes itself as "a unique museum where you can actually hold, turn pages and read some of the rarest printed Bibles and rare theological books on the planet." Created and maintained by a Southern Baptist congregation, this museum seeks to "preserve and display antiquities from the land of the Bible" and "demonstrate the historical and geographic authenticity of the Bible." Attraction's mission "is to preserve, research, interpret, and present to the public ancient artifacts and texts so as to promote the understanding and teaching of religious history, especially biblical history and the history of the biblical text." Collection of Armenian Illustrated Bible from 17th century. Owned and operated by the Wycliffe Bible Translators, this attraction invites visitors to "use all of your senses as you learn about the art and science of Bible translation through award-winning multimedia and games." 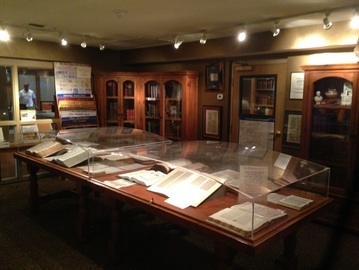 Part of a ministry organization, the "antique Bible Museum" features rare Bibles and Bible-related manuscripts. The site also features a replica of the Tabernacle in the Wilderness (cf. Re-Creations). Housed at Wheaton College, the 20,00 sq. ft. museum uses "rare artifacts and interactive displays" to tell the history of Christian evangelism, focusing on "the early history of America" through the work of famous evangelists like Billy Sunday and Billy Graham. Housed at Anderson University, a Church of God-affiliated college. The collection features "original artifacts from many periods of the Ancient Near East." Housed at Baker University, a private United Methodist university. Collection includes more than 600 volumes. Curated by the New Orleans Baptist Theological Seminary, this museum combines "authentic" artifacts, "reproductions of well-known artifacts," and a "study/research collection" of "sherds." Exhibits and displays focus on "daily life in biblical times," the "world of Abraham and the Patriarchs," "the world of the Israelite Monarchies," "archaeological method," "archaeology of religion," and "the earliest evidence of writing." Located in the historic 1913 home of the first Coca-Cola bottler, the Bible museum features rare Bibles and biblical literature. Attraction dedicated to "significant aspects of ancient material culture, [in order to] provide insight into the history of mankind and illuminate the biblical world." Housed at the University of Minnesota-Duluth, this collection "numbers over 1,800 volumes, representing 410 languages." Items include: 13th century Torah scroll, first edition King James, 1554 Erasmus New Testament, first edition of Cherokee New Testament, and an Aztec lectionary. Housed at the private Catholic university of Saint John's, the museum features original pages from the Saint John's Bible: the first Benedictine commissioned handwritten and illuminated Bible since the invention of moveable type. Museum collection includes "papyrus fragments, 13th century Torah, 12th and 13th century Bibles, 17 century illuminated scroll of Esther, an Ethiopian manuscript of the Psalms, a Wycliffe Bible, 1460 Book of Hours, and full-sized facsimiles on parchment of three of the Dead Sea Scrolls." Collection features "one of the largest ancient lamp collections in the world if not the largest comprising more than 250 lamps [as well as] weapons, coins, cosmetics, funerary, ostracons, inscriptions, artifacts from ancient kingdoms of the Persians, Akadians, Ur, Sumerians, Babylonians, Egyptians, Israelites, Romans, [and] Grecians." Based at Pittsburgh Theological Seminary, the museum focuses on "daily life in ancient times including landscape and settlement patterns; domestic and communal architecture; agriculture and food preparation; technologies, crafts, and stylistic traditions; trade; religious observance; and memory and writing systems and practice." Dedicated to "the Bible and science," this attraction features several traveling exhibits of artifacts and replicas, including minerals, fossils, manuscripts, and items named in the New Testament. Hosted at North Greenville University, a Southern Baptist college, this collection "spans the history of the Bible from the earliest times to the beginning of the computer age" in over 20 languages and also displays biblical artifacts (e.g., pottery, coins). A biblical art museum, that includes a permanent collection of biblical antiquities. Housed at Southern Adventist University, this collection's "goal is to actively engage visitors of all ages through collection, conservation, education, and exhibition of archaeological artifacts from the biblical world." Just east of Memphis, this museum features a permanent exhibit of "ancient Near Eastern and Classical artifacts and artifact replicas as well as maps, images, and interpretive texts," and one temporary exhibit. The museum also hosts lectures, workshops, and archaeological digs for kids. A one room attraction, set amid the leisure destinations of Dollywood and Pigeon Forge, TN. The collection showcases "artifacts, rare Bibles, Bible pages, and rare books telling the exciting chronological history of the Bible’s progression into the English language." Traveling museum with replicas and artifacts. Housed at Southwestern Baptist Theological Seminary, this attraction features three galleries: Old Testament, New Testament, special exhibitions. Housed at Houston Baptist University, the museum displays "rare Bibles...ancient manuscripts, decoratively illuminated medieval Scriptures, examples of the earliest printed Bibles, the earliest Bibles in English, the earliest Bibles printed in America, [and] Bible translations from across the centuries and around the world." The museum is housed at Liberty University's Center for Judaic Studies. The Center's director describes the attraction as "a unique educational collection of authentic, biblical-era artifacts that provide the historical and cultural background of the Jewish people over a 4,000 year period." Attraction uses The Giant Bible of Mainz and The Gutenberg Bible to narrative the transition from "manuscript writing" to "moveable type." The museum collection consists of "1,500 editions of the Bible in more than 150 languages." The 430,000 sq. ft. building "will provide guests with an immersive and personalized experience as they explore the history, narrative, and impact of the Bible." The Museum is centered around the ~40,000 piece Green Collection, owned by the founders of Hobby Lobby Stores, Inc.
Collection of 3rd to 6th century manuscripts. Collection features "more than 1400 Bibles, together with models and artefacts associated with the Bible message." The attraction also has a butterfly and Bible garden with "trees mentioned in or related to the Bible, such as a Cedar of Lebanon, Pomegranates, and a 100+ year old Holm Oak, and Papyrus reeds." West of Sau Paulo, this museum features rare Bible manuscripts and other items, such as a scale model of Noah's ark. A 1200+ piece collection that began in 1967. Located in western Germany, this museum focuses on Bible printings from early scribes to the medieval period and the post-Reformation printing press era. The museum is housed at the University of Munster's Institute for New Testament Textual Research. The collection features manuscript items like the Koberger Bible (Nuremberg, 1483). Features 270 archaeological artifacts, model of Herod's Temple, and replica of Galilee boat. Traveling biblical museum curated by Alexander Schick. In existence since the early 1990s, this attraction has been under construction since 2011. The renovated museum will feature two sections: a "traditional" Bible manuscript collection showcasing different translations (with a focus on the Bible in Hungary), and an "interactive Bible experience." An exhibition of the Bible Society of India, this attraction also includes a Holy Land model. Artifacts from four biblical cities: Lachish, Jericho, Jerusalem, and Buseirah. A special permanent exhibition at Trinity College Dublin Library, the Book of Kells is a 9th century lavishly illuminated version of the four New Testament Gospels. It is widely regarded as a national treasure of Ireland. The Book is divided into four sets, only two of which are on display at any given time. Housed at the Israel Museum, the Shrine of the Book displays Dead Sea Scroll manuscripts and other "exceptional archaeological finds." This "interactive time capsule" is located in the heart of Jerusalem. Twenty galleries of "ancient artifacts" narrate biblical time from "the sons of Noah" to the early Christian Era. Bible Lands claims to be "the only museum of its kind in the world." Housed at Hebrew Union College, "the exhibition tells the story of three ancient biblical cities: Laish/Dan, Gezer, and Aroer." Based around the work of the earliest Latvian Bible translator, the collection features over "220 Bibles, 210 hymnals, 170 editions of the New Testament, 40 Books on Preaching and more than 210 other Christian books, such as the Old Testament, Gospels and textbooks in Latvian and more than 35 other languages." This Dutch museum mixes a manuscript collection (including the oldest Bibles printed in the Netherlands, dating to 1477) with archaeological artifacts (oil lamps, clay tablets, pottery, coins) and antiquities (inscribed stele, funerary figurines, canopic jars, scarabs, and a complete mummy), and small-scale biblical models (Moses' Tabernacle, Herod's Temple) (Re-Creations). Interactive attraction that includes a replica of the Qumran cave, "life-size" figure of Paul, artifacts and scale models, Bible manuscripts, and "area where guests can dress up like Bible characters." Houses 80 manuscripts in over 750 languages. Houses more than 400 archaeological object. Part of the Welsh National Trust, collection includes copies of the first Welsh language Bible and Bibles in more than 100 different languages.